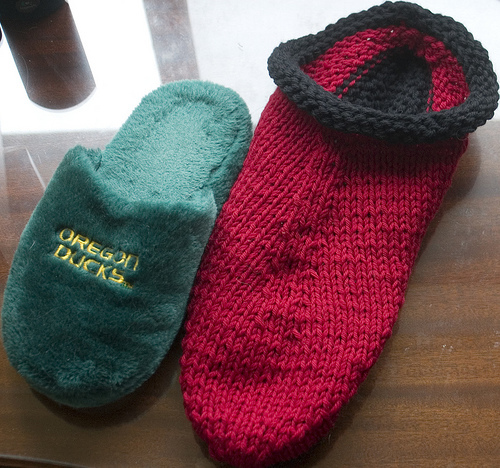 As it has gotten colder, my husband realized he needed slippers. I finished this first one ages ago, and am currently aiming to complete the second one this weekend so they can be fulled to size (fulling is the process by which you shrink a piece of knitting using hot water and agitating, frequently inaccurately referred to as felting). They’re the Fibertrends Felted Clogs (on Ravelry here). It’s a fairly easy pattern, although some of the short-row shaping is complex because you turn the work several times in one “row” of the pattern. Worked with two strands of worsted weight yarn on size 13, they’re something of a hardship on my hands although they knit up quickly. Full review once they’re finished and fulled. The desk under the window is my best shot at getting non-flash photos on dark rainy days. However, it leaves weird reflections and I didn’t have anything to make a good backdrop underneath the slippers.